Our Lovely Cobalt Blue Glass Containers not only look attractive on your vanity but serve an important purpose. Glass does not interact with the product ingredients, thereby maintaining the vitality of the botanicals, essential oils and nourishing agents. These jars are too pretty to throw away, so reuse them or return to AromaFace for recycling. Why is Glass Better for you? Many plastic containers contain industrial compounds such as Bisphenol A, PCB & Phthalates. These compounds imitate estrogen hormones and are termed xenoestrogens. Xenoestrogens are considered endocrine disruptors. They are associated with a variety of health conditions such as, early onset puberty and breast cancer. These types of plastics are found in many commonly used containers, even Baby bottles! Personnel care products can become contaminated with these compounds. When the product is applied to the skin, it has potential to be absorbed into the body through the skin. Once upon a time, it as thought that skin was impermeable. Research has shown that many substances are allowed into the bloodstream. AromaFace packaging is good for you and the environment. Only our Fruit Wash is in a plastic container. It is a non-reactive plastic container, free of the above toxic compounds. We wanted a non breakable squeeze bottle, that wouldn't break in the shower. AromaFace™ Fruit Wash bottle is recyclable. What can I do to protect Myself & my Family? The stability of Plastic containers can be compromised from heat or cold. Also, over time plastics break down and the potential of toxic compounds leeching into the product increases. When we freeze or heat foods and beverages in a microwave, undesirable changes occur in the plastic packaging. 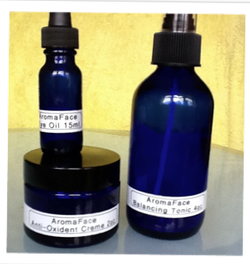 Click for info, why AromaFace™ is a pure product!